4-CD boxed set (LP-format) with 48-page book, 108 tracks. Playing time approx. 284 mns. 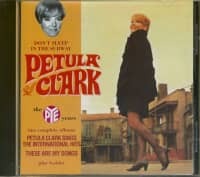 Best known for such 1960s hits as Downtown, My Love and This Is My Song, British pop singer Petula Clark has spent six decades as an international superstar, with worldwide sales of over 70 million records. In addition to her English and French recordings, Petula recorded many songs in German, Italian and a few in Spanish. Many of these songs are available for the first time on compact disc, including the hits Monsieur and Chariot (the original version of I Will Follow Him), the 1965 San Remo Festival entry Invece No, the German and Italian versions of Downtown, and over a dozen previously unreleased songs and alternate takes. 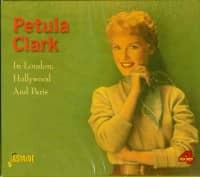 This lavish 4-CD box contains all of Petula Clark's German, Italian and Spanish recordings. There is also a deluxe full-color book with an essay by Jim Pierson, the stories behind the recordings, dozens of rarely seen photos, and memorabilia. 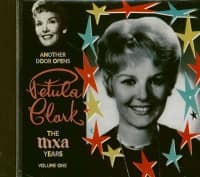 From her childhood days performing for Allied troops during World War II in her native England, to more recent triumphs such as the Broadway stage in America, Petula Clark has spent five decades as the epitome of an international star. Nowhere is her widespread appeal more evident than in a rundown of various countries in which she has earned hit records: Australia, Belgium, Canada, Denmark, Germany, Holland, Italy, Singapore, South Africa, the United States, and, of course, the United Kingdom. As a result, Petula has amassed cumulative global sales of over 60 million recordings. To the popular music world, Petula is best known for her melodic string of 1960s English hits, including Downtown, I Know A Place, My Love, I Couldn’t Live Without Your Love, This Is My Song, Don’t Sleep In The Subway and other feel-good classics. However, from the late 1950s through the 1970s, Petula simultaneously enjoyed major successes with records in multiple languages. Although her hits were primarily English and French, Petula was prolific with German and Italian sung releases too. Born on November 15, 1932, at Epsom in Surrey, England, Petula Sally Olwen Clark became a beloved child star in her homeland, singing in music halls and performing on the radio -- where she even had her own program, 'Pet’s Parlour.' She appeared in motion pictures (1944’s 'A Medal For The General' marked her debut), on television, and, in 1949, began issuing records (her first being an Australian release of the Teresa Brewer tune Music, Music, Music). Petula’s father, Leslie, served as her manager during the early years of her career. With record producer Alan Freeman, he established Polygon Records in 1950, for which Petula was placed under contract. (The label was later merged with Nixa and subsequently folded into the Pye imprint, for which Petula would record in the U.K. through 1971.) Throughout the 1950s, Petula scaled the British hit parade with such records as Where Did My Snowman Go?, The Little Shoemaker (both capitalizing on her lingering image as an adored juvenile star), Suddenly There’s A Valley and With All My Heart. During this time she continued a multitude of radio, stage, television and film activities as well. Firmly established as one of England’s top entertainers, Petula nonetheless felt hampered by the British public’s tendency to still view her as the cherished child performer who had first endeared herself to the nation by singing songs of hope and strength to servicemen and civilians alike during the dramatic days of the war. The youthful image seemed inescapable to Petula, who longed to be fully accepted as an adult performer and to pursue a more sophisticated direction in her career. Fortunately, the solution was merely a continent away. Starting in 1957, Petula’s English language records were released in France. She also gained notoriety in that country due to local singer Dalida’s successful cover versions of Petula’s songs for the French speaking-market. In November of 1957, Petula was invited to perform at the celebrated Olympia Theater in Paris. Following a warm and enthusiastic reception, she was encouraged to record her own songs in French and she accepted a contract with Vogue Records for label representation in France. Petula was embarking on an exciting and challenging new phase of her career in a country largely distanced from her past -- a country which would allow her to mature professionally. Petula’s multi-lingual recording career branched out further in 1962 to encompass Germany and Italy. The global record business was expanding and because of Petula’s strong acceptance in France, Vogue decided to promote her in other territories with custom-made releases for their affiliated labels. Again, Petula was instantly embraced. The breakthrough for Petula in Germany was Monsieur, a number one novelty tune which signaled the playful, light formula to be taken with many of her early German tracks. 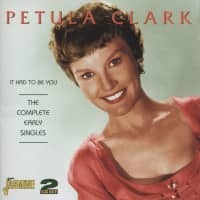 The song earned Petula a gold record award with sales of a million copies and was cited as the largest selling single up to that time by a foreign artist. Although Monsieur was Petula’s initial German release for Vogue, a subsequent single of St. Tropez backed with Du bist mein Anfang und mein Schluss (the former being a rerecording of one of her English and French selections) was actually recorded back in 1960 but had remained unissued until Petula’s German recording career was fully activated a couple of years later. Petula recalls her experiences in the recording studio: "When I was asked to record in different languages I asked for them to keep it very simple for me. I would arrive in the studio and everything would be done except for me. It is not my favorite way of working. I really like to be there when the track is being laid down. It almost never happened on these sessions. They were mostly songs which I’d already done in French or English or songs that were written especially for me. It seemed that I was able to do it very well and fairly quickly, much to my surprise, and they gave me more and more to record. I found the German language more difficult than Italian, probably because by then my French was pretty fluent and I was finding Italian much closer to French. Some of the German sessions I found particularly stressful, although I’ve been told that my German sounds very good. I was also told that the Italians were sure that I could speak fluent Italian, apparently it sounds as if I had an accent from Genoa, but it didn’t sound English at all -- that’s what I’ve been told." Customer evaluation for "The International Collection (4-CD)"